I have seen the Marvel film, “Black Panther,” multiple times in the movie theater. In fact, the first two times were during the same weekend. I love this movie for so many reasons: the storyline, the characters, the setting, the costumes. But, what also really stood out for me was the mind-blowing technology utilized throughout the film. As a technologist (as well as lifelong sci-fi aficionado), this aspect of the film got me thinking. How close are we to Black Panther’s Wakanda, the fictional African nation that is generations ahead of the rest of the world technologically? I mean, I know we won’t likely be wearing vibranium suits anytime soon (as that material only exists in the imagined Marvel cinematic universe), but what about the other technologies depicted? One technology that stood out to me were the Kimoyo Beads worn by King T'Challa. Kimoyo Beads are a piece of advanced communication technology developed and used in the technologically advanced nation of Wakanda. Each bead has a different purpose. The Primary Bead provides medical knowledge about the individual Wakandan—this is given at birth. The AV Bead provides a holographic display allowing them access to the Wakandan database (their internet). They can access video files and receive broadcasts on any frequency. The Communication Bead can be used to communicate with other Kimoyo Beads (their flavor of mobile phone technology). If the Wakandan moves their hand in a form of sign language they can send text messages. Beads can also be added for additional scenarios such as home and personal security or GEO tracking. Not simply a fashion statement, those Kimoyo beads serve a larger purpose. Like a mobile device, the Kimoyo beads act as a gateway to Wakanda’s own version of the Internet of Things (IoT). IoT is the network of physical devices, vehicles, appliances and other items embedded with electronics, software, sensors, and connectivity that enables these objects to connect and exchange data. As we move around from location to location, our mobile device (or, in this case our Kimoyo beads), help us seamlessly communicate with various other devices. Some of these devices might be in our homes, some our offices, some in our cars or even in the Black Panther’s Royal Talon Fighter jet. Gartner predicts that by 2020, IoT technology will be in 95% of electronics for new product designs. Moreover, they predict that the IoT installed base will grow to 26 billion units by 2020. And at the forefront of advancing IoT technology is Microsoft. In fact, the production designer for “Black Panther,” Hannah Beachler, actually studied Microsoft advancements to inform her design of the Kimoyo beads, as well as the other wearable technologies featured in the film. Last month Microsoft announced that they will invest $5 billion in the Internet of Things over the next four years. Their goal is to give every customer the ability to transform their businesses, and the world at large, with connected solutions. Microsoft’s IoT platform spans the cloud, operating systems, devices, creating trusted, connected solutions that improve business and customer experiences, as well as the daily lives of people all over the world. On the micro level, you see this in their Dynamics 365 platform, which connects multiple points of business into one application to streamline business processes, improve customer interactions, and enable growth. 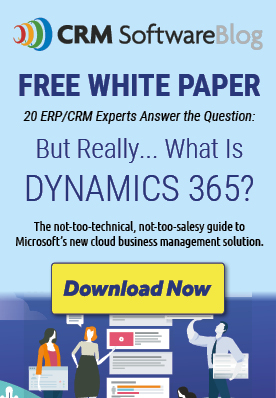 Microsoft Dynamics 365 CRM is the foundation for a suite of productivity applications for your business. This innovative solution breaks down the silos between CRM, ERP and productivity to offer one system for everyone. On the macro level, you can see this in Microsoft’s Azure IoT, a comprehensive collection of services and solutions designed to help people create end-to-end IoT applications on Azure. And now there’s Microsoft’s Azure IoT Edge in preview, which will allow you to deploy complex event processing, machine learning, image recognition and other high value AI without writing it in house. What makes “Black Panther” so exciting (or at least one of the things that makes it exciting, because this movie is awesome on so many levels) is that the fictional technologies depicted in the film are inspired by real-life technological innovations. Remember that high-speed magnetic levitation subway that runs through Wakanda's famous vibranium mine? How different is that from Hyperloop, the high-speed, vacuum-powered railway that Elon Musk says will someday be able to carry passengers from New York to the capitol in under 30 minutes? Floating 3-D displays are not far from becoming a reality either. While it may not be as crisp and as clear as the holograms of people you ring up on your Kimoyo beads, Microsoft is working on “Holoportation” in which users will be able to project a full-body likeness of themselves to a remote location, seeing, hearing, and interacting with others as if they are in the same room. If you are interested in learning more about Microsoft Dynamics 365, Microsoft Azure, or if just want to talk about the awesomeness that is “Black Panther,” get in touch!